Vibrant colors are illuminating the landscape and the Harvest Moon is upon us. Autumn is the perfect time to relax and unwind with a cup of tea. 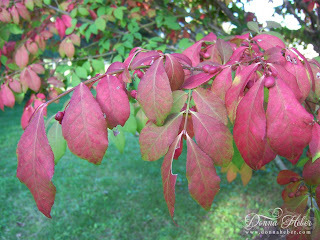 Please join me today by our burning bush (Euonymus alatus), which is starting to turn a beautiful shade of scarlet red. The beauty of a branch. Tea today is pumpkin spice served in a teacup and saucer produced by Ridgway of the Staffordshire Potteries under their Queen Anne Style. This beautiful autumn pattern has rosehips, autumn leaves, tiny yellow flowers and grasses in orange-yellow, green and brown with gold gilding on the outer rim. 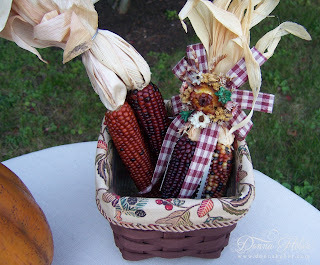 Pumpkin candles with a rustic painted finish and Indian corn grace the table. 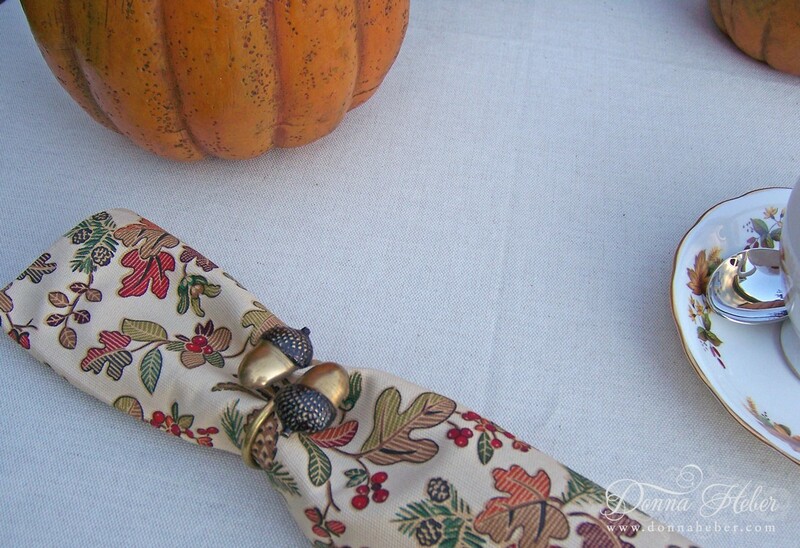 An autumn path napkin with antique brass acorns and a merlot basket completes our autumn theme with scattered leaves, acorns and pinecones. I hope you'll take a moment to appreciate the simple, natural beauty of the season. Thank you for stopping and having tea with me. I am linking with the following ladies this week. 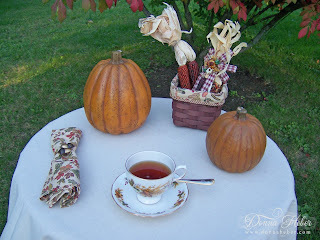 Such a sweet autumn tea, and I like the flavour; actually I like anything pumpkin. The teacup design is perfect for this time of year and the acorn napkin rings are lovely. I am envious of your burning bush; if mine ever got that big, I would be one happy gardener. Every winter the bunnies munch on mine, I've even moved it to the front to keep a better eye on them. Oh well, they need to eat too. wow donna wonderful tree, it looks gorgeous with those colorful leaves. Love your Fall pictures. My favorite time of the year is Fall. Your tablescape is so pretty with the tree in the background. Wish I could be there. WHAT A BEAUTIFUL TREE, AND THE LEAVES SAY AUTUMN. 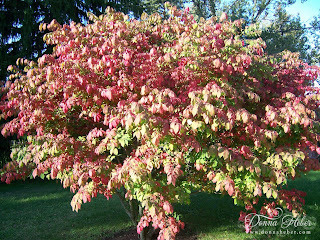 What a lovely post and such a pretty burning bush - always a favorite in fall! Thank you Donna for participating! the bush is truly pretty, love the vibrant red. 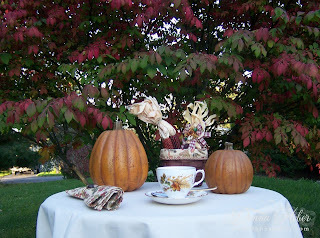 And your tea cup is so perfect for fall. Thank you for sharing this nice tea time. Oh how pretty! I do miss autumn as we don't have seasons in Malaysia, but I don't miss winter! Beautiful! Love the tree and the teacup! I will have some tea with you in such a beautiful setting! I will be right there for a cuppa. I bet your gardens and yard are beautiful at this time of year. 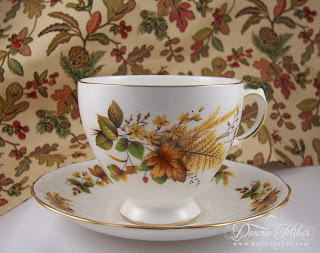 The tea cup is so perfect for tea during this season. What a wonderful setting as always. Thanks for sharing and please know that you are always most welcome to visit and/or even partake by linking up next week if you'd care to, with 'Teapot And Tea Things Tuesday', and also, Tuesday Tea For Two in our little corner of, Tuesday Teatime In Blogland. I always adore having you! I am so happy to have you join me again for tea. Your Queen Anne teacup is lovely and your decorations are too. 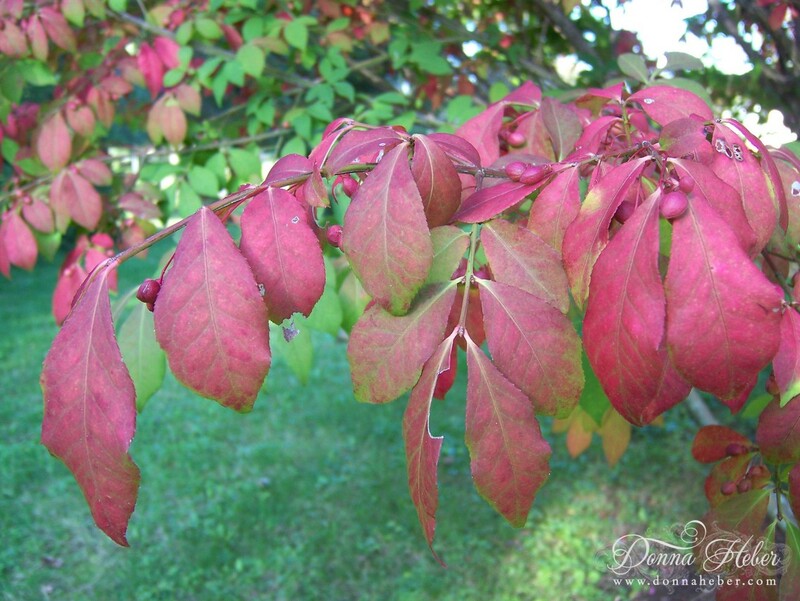 Beautiful shots of your Autumn leaves and bushes. Thank you for sharing with us. I didn't know about the "Ridgeway" connection. 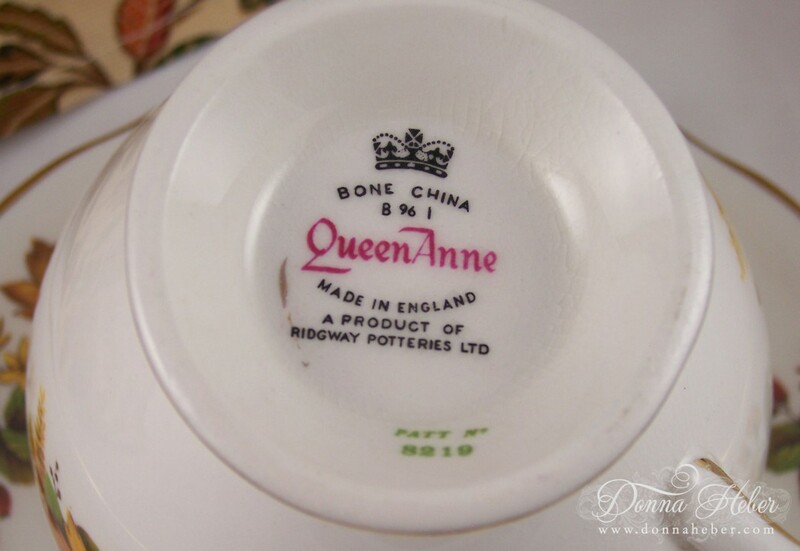 I had a post not long ago with a cup and saucer that each had a Queen Anne marking, but not Ridgeway on the bottom. Yours is lovely, as in the whole table setting! lovely cup, thank you for sharing and visiting for tea this week! Please come back soon.